Step 1:Order new buses. Step 2:Change livery colours to make a sub fleet for b-line routes, and go for new branding as well, because why not. Step 3:Cover said new bus in a full body ad wrap before its even out on the streets to differentiate from the rest of the fleet for the desired effect of having a noticeable "rapid route" Step 4:Profit? Maybe this isnt the right place, but could someone please explain all the Nova hate to me? I will admit, I don't really get many chances to ride them as I live and work within Surrey. But when I do, they ride just as well as any other bus ( I have ridden both hybrid and normal diesel novas). Saw 7403 Getting towed from King George Blvd at 104 Ave around 6:50 this morning. Call me weird, but I kinda like it. My only issue is with the "Rapid Bus" branding. We already use "Express bus", so why change it? While the colours are mostly different from the usual livery, at least it follows the same design. Spotted 2 new Nova HEV's headed west bound on highway 1 between carvolth and 160th. Was unable to get numbers for them though sadly. I wull say they look really nice. S18114 spotted at Cummins in Port Kells. 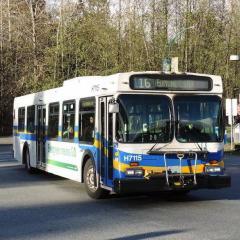 Admittedly, I havent had much chance to ride any of our CNG(1 C40LFr, 2 XN40) busses as I both live and work in Surrey (and we're only just now getting them at STC), so I dont have the best of knowledge when it comes to how the roll is on them, but after taking the 335 for the past 4 years and with how there is extra weight at the top from the fuel tanks, I can only assume till I get the chance to actually take one on the 335. I'm a little surprised they are putting the XNs on the 335 Newton, as there is a particularly nasty corner @ 100 ave and 160 st. which causes even the d40lf/r's to lean quite impressively. Saw 1205 and another WV xcelcior sitting at Cummins in Port Kells today. Been sitting there for a few weeks now. Would have grabbed a picture myself but all I have is a potato for a phone/camera. I look forward to such cost saving measures as single tracking down 104 except at stations,and to keep all 4 traffic lanes by shrinking the lanes down to the size of the ones on the pattullo bridge. No,it appears to be the Green Power EV550 Double decker that's at VTC. 7196 should be at STC. I was riding it yesterday on a 335 in the afternoon. Which back one of the most entertaining trips ever as I saw a hobo knife fight around King George and 108 then as well. Not going to lie, but I find the mental image of a 30' LFS absolutely hilarious. Sorry, I understand what you're getting at now. To which I will agree with that. I just want this election to be done so we can get to the part where we watch all the cool new stuff get built.